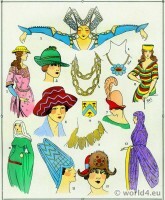 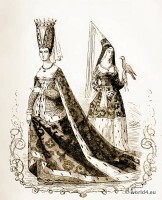 Home » Headdresses of the 14th century. 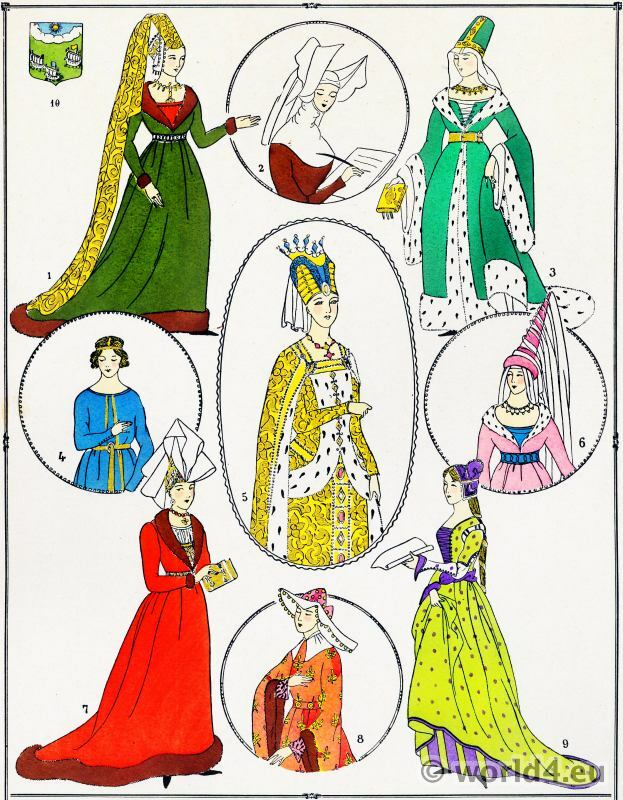 Quite characteristic of the earlier part and middle of the fourteenth century, to which the manuscript from which these figures are taken appears to belong, is the variety of ornament which they exhibit. 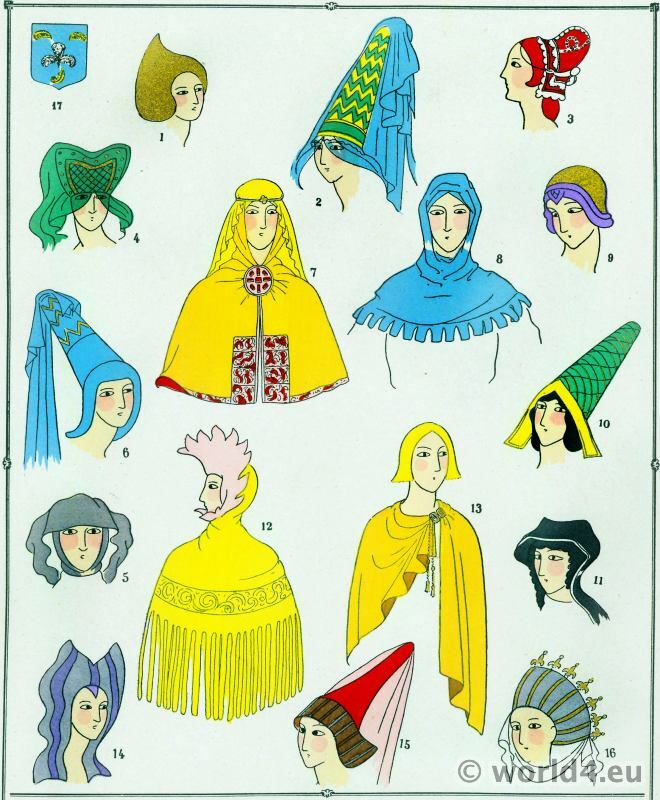 At this period of our annals, almost every different illuminated manuscript, even illumination of a manuscript, furnishes us with some new form of lady’s headdress: and their colors vary less than their form. 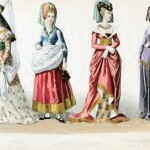 This variety of shape and the costume of the time afforded a never failing subject of satire to contemporary writers. 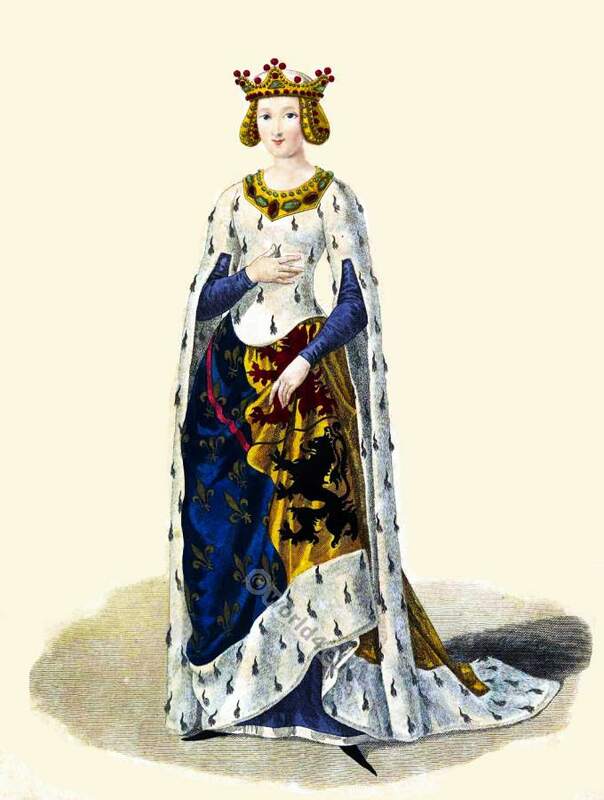 The manuscript to which we have just alluded appears to have been written and illuminated towards to the south of France, about the time of our King Edward III. 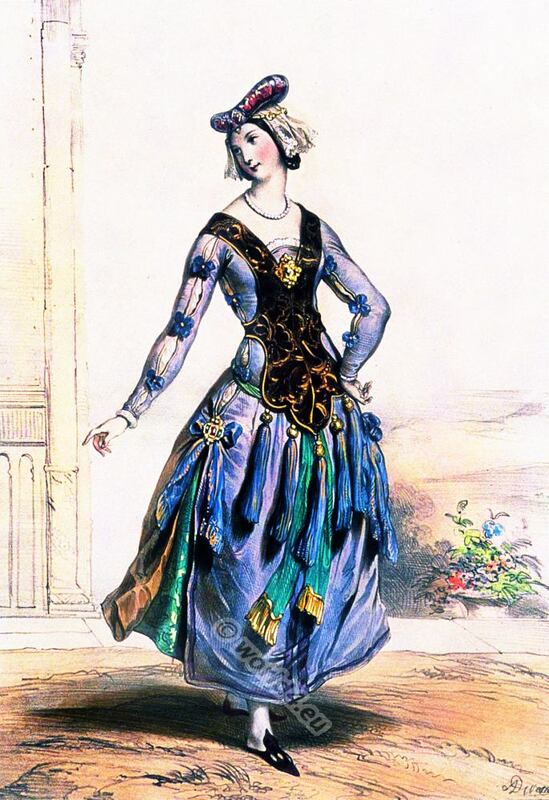 It was formerly in the Lamoignon collection, from whence it passed to the library of the Duke of Roxburghe, and it has lately been purchased by the trustees of the British Museum for the sum of £200. 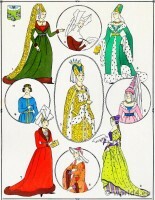 It is a fine manuscript on vellum, containing a copy of the prose French romance of King Meliadus. 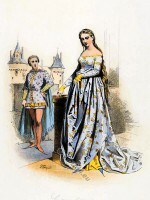 Meliadus, according to the romances of the Round Table, was the father of the famous Tristan, and his history was extremely popular in the fourteenth century. 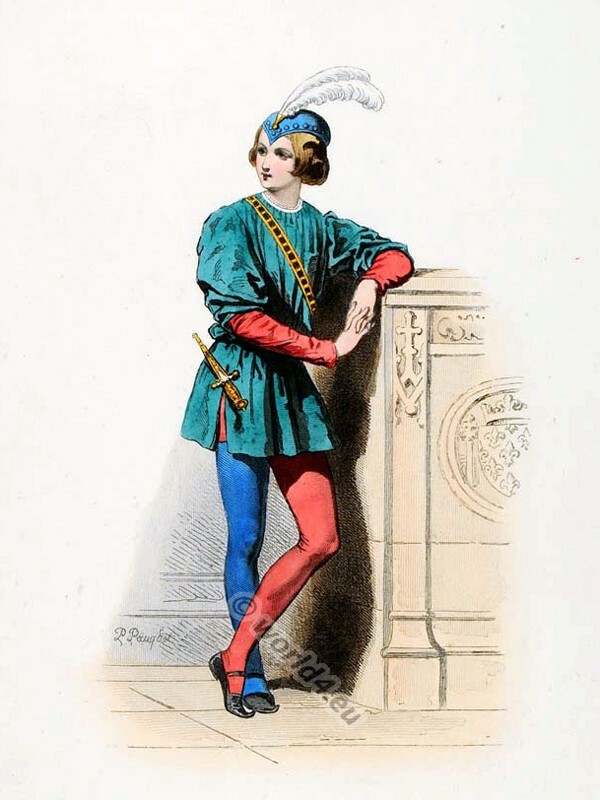 It was composed in the latter years of the thirteenth century by an Italian named Rusticien de Pise, and is sufficiently common in manuscript. 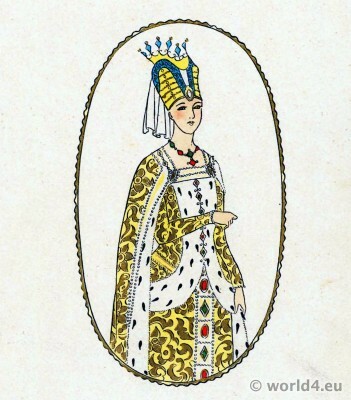 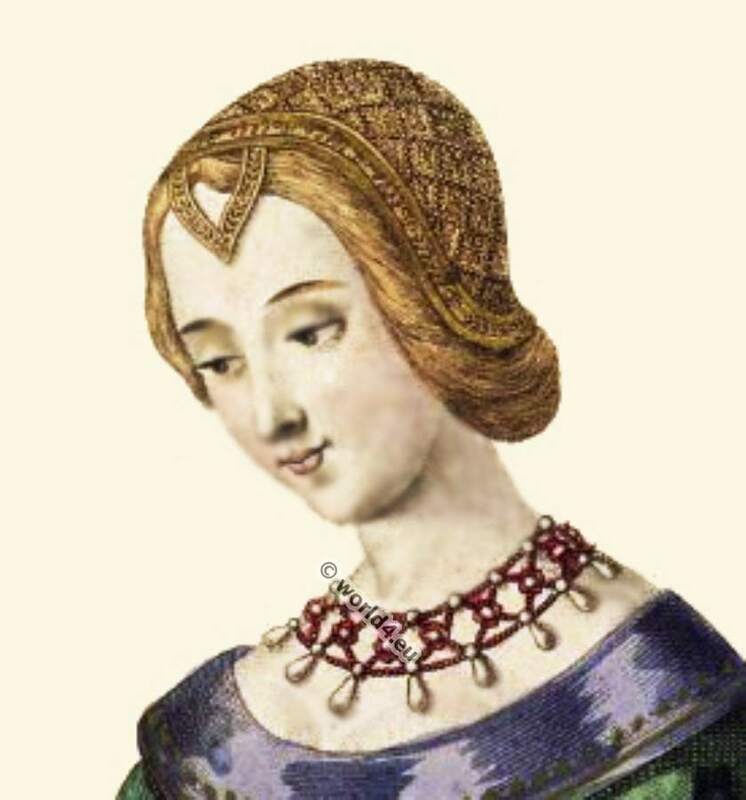 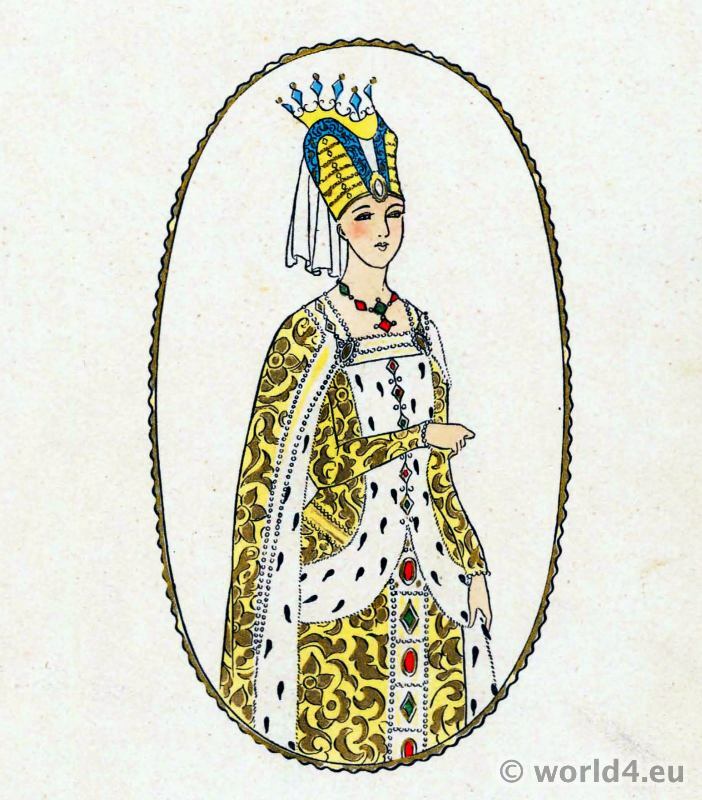 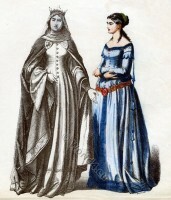 England court lady 14th century. 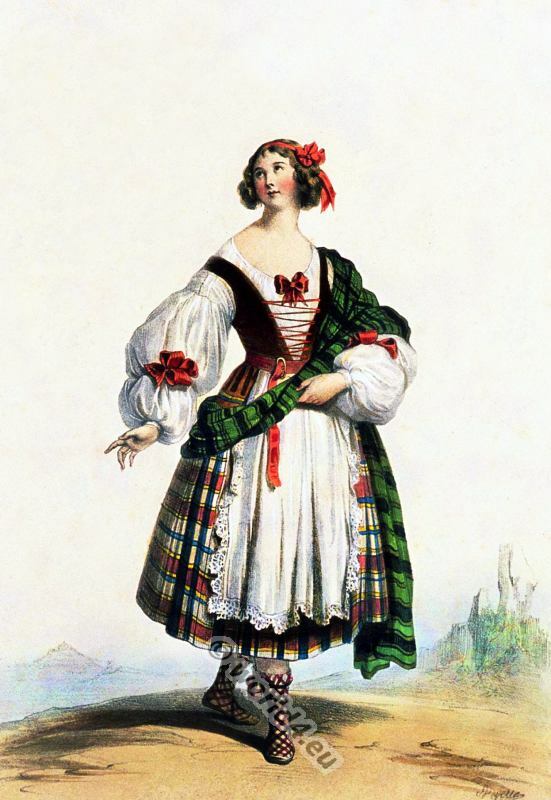 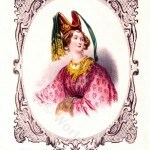 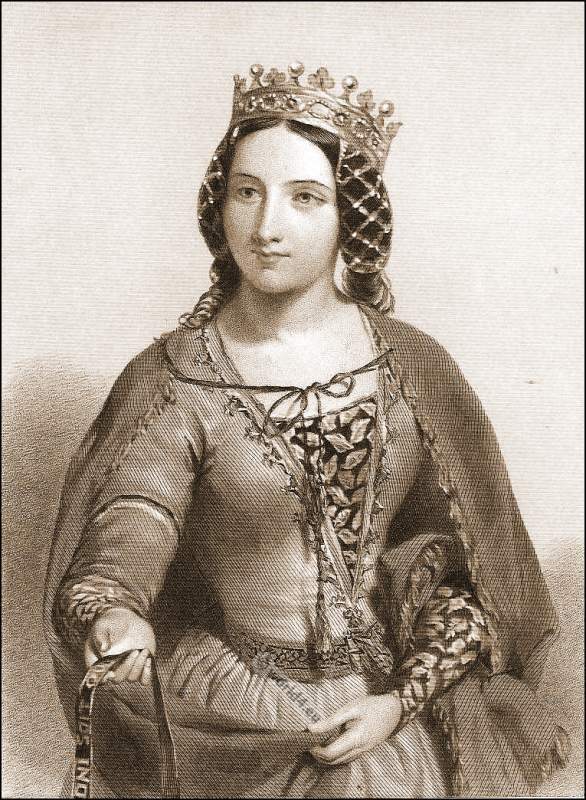 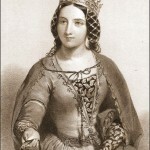 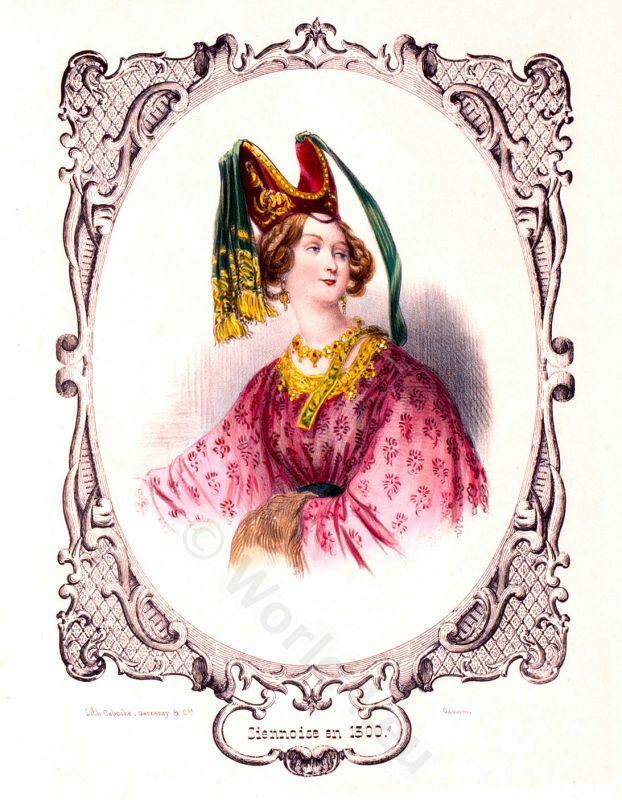 Dame Anglaise au XIV Siècle. 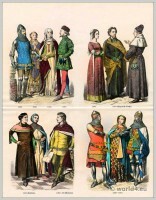 Page of the French court of Charles V, 1380. 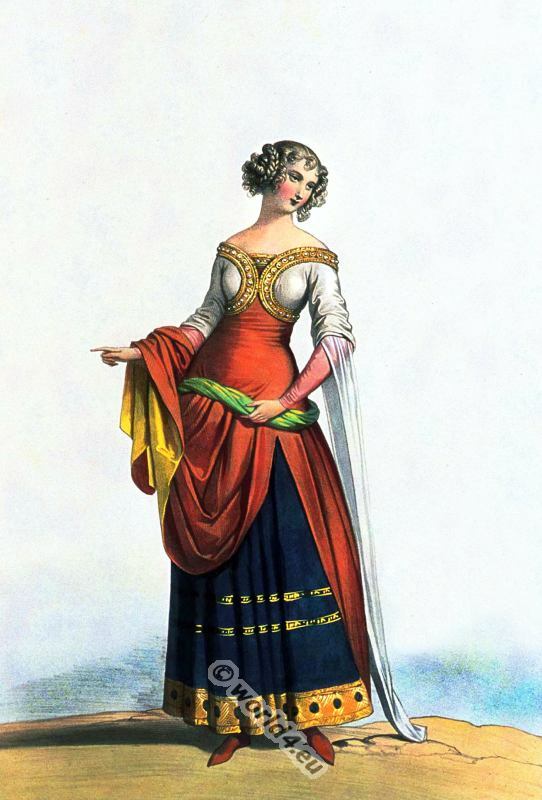 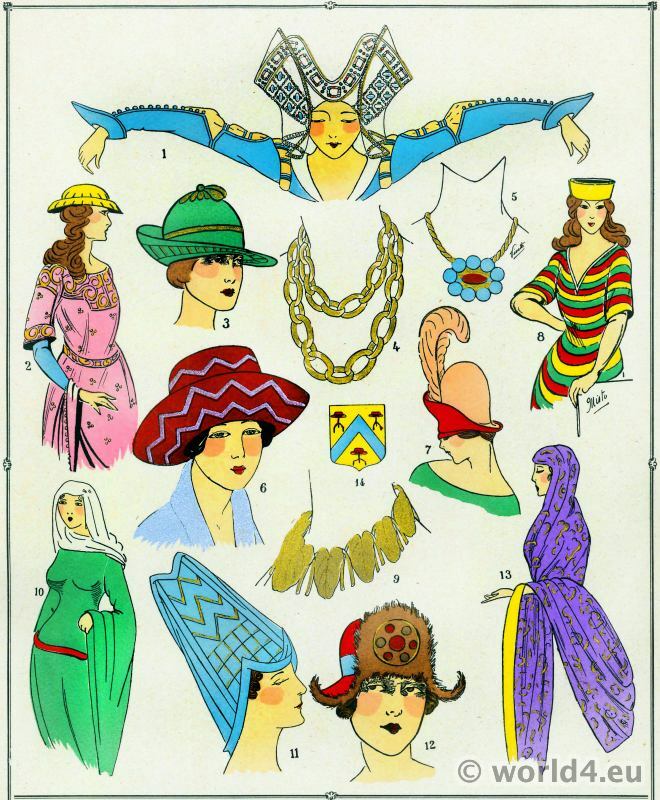 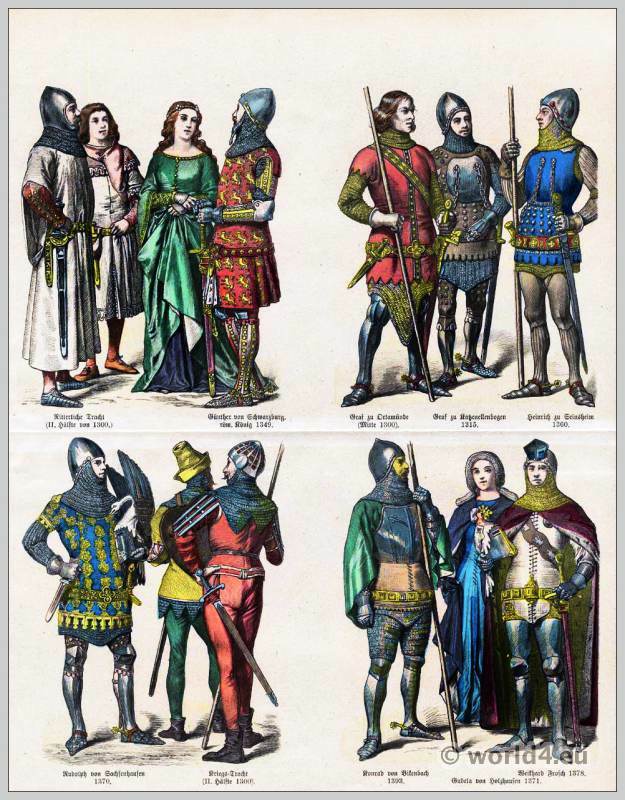 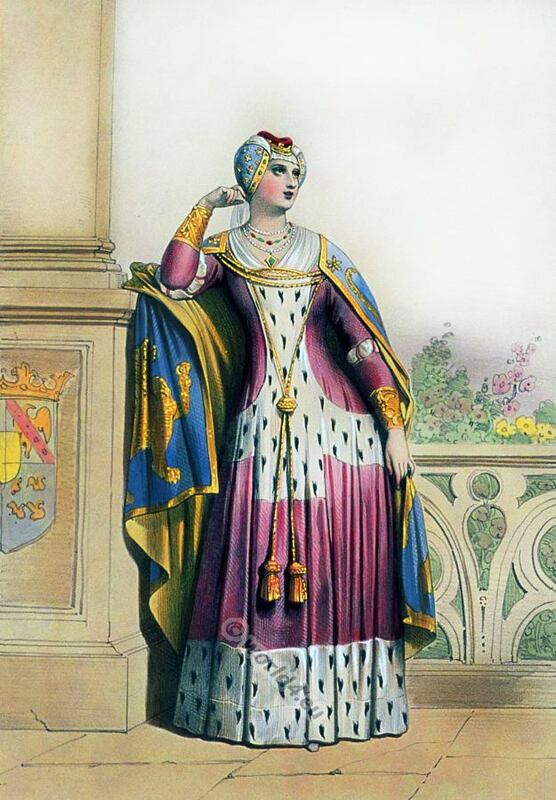 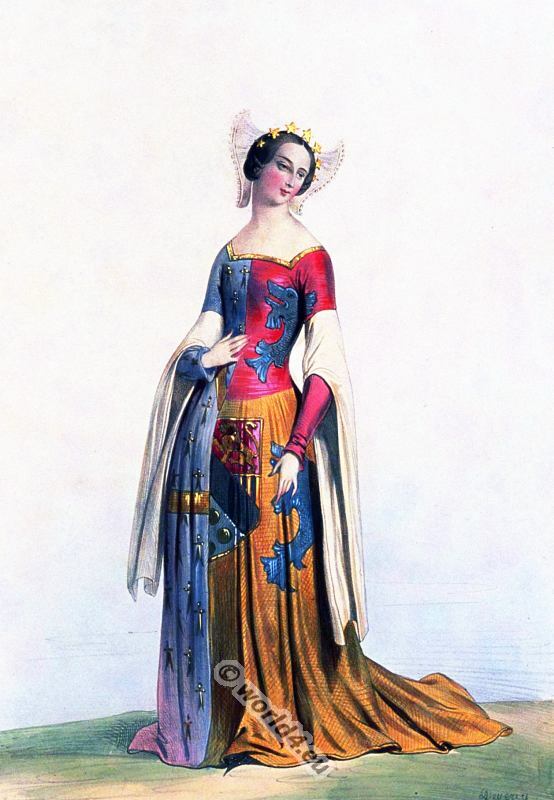 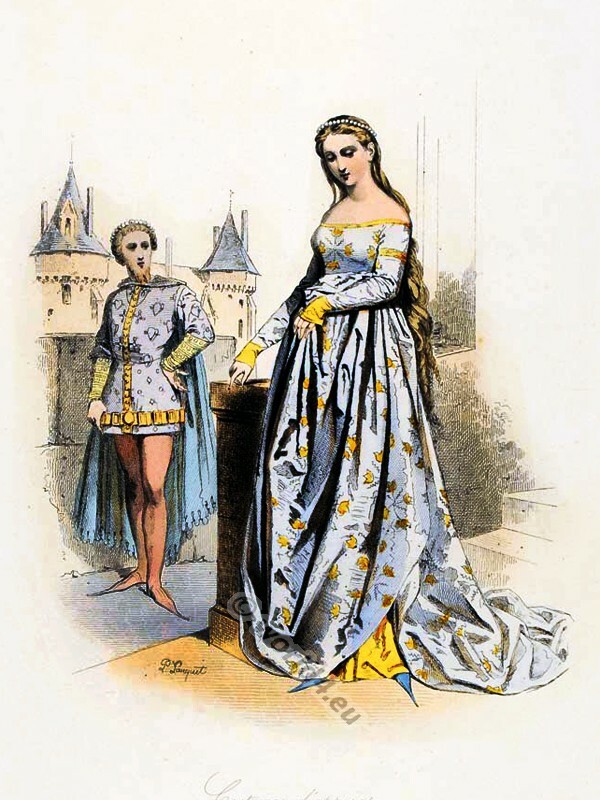 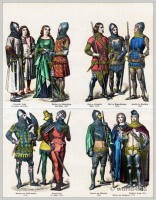 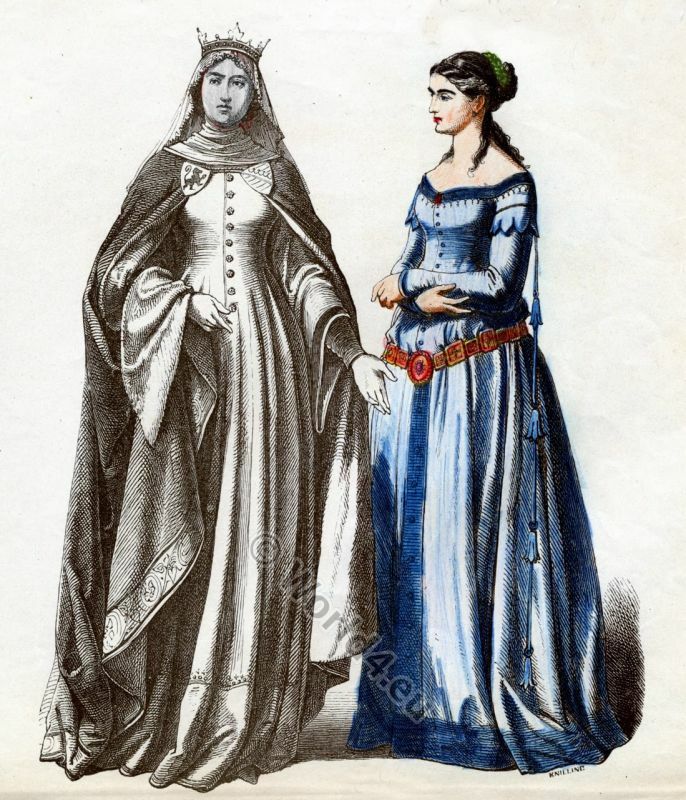 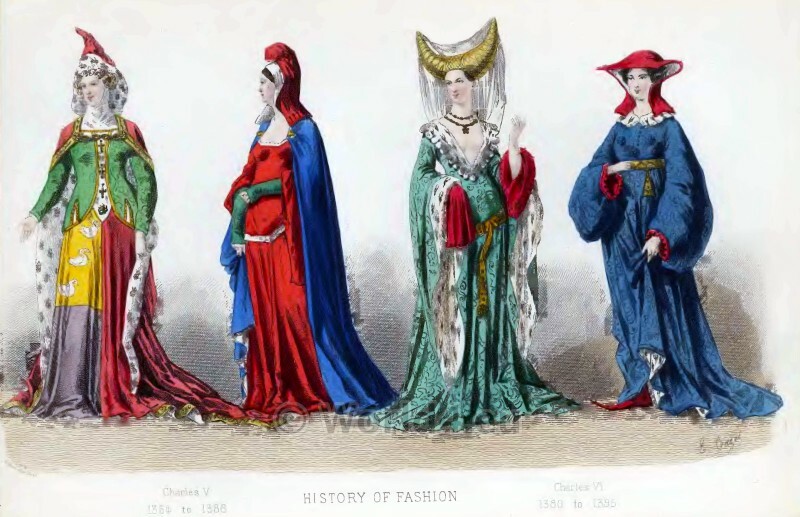 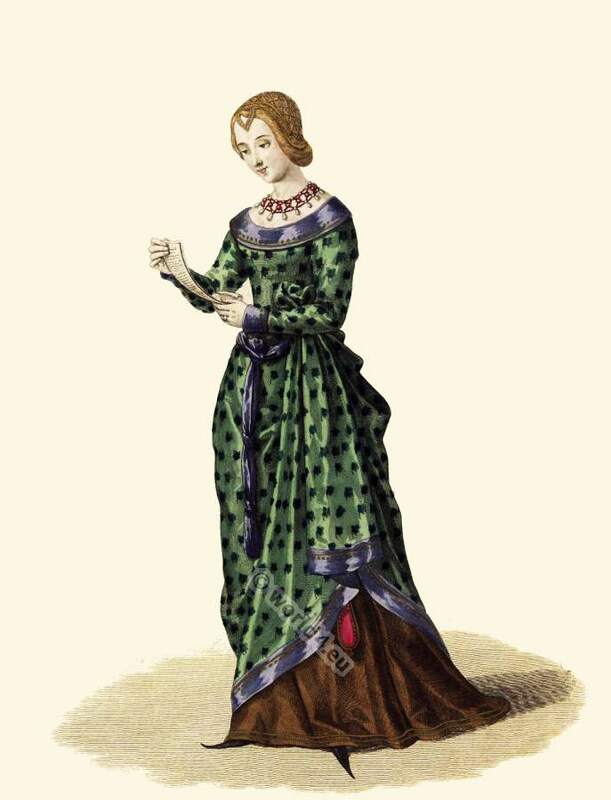 French Fashion 1350 to 1380. King Meliadus, one of Arthur’s Knights, was one of the preux chevaliers of romance; his story is a combined series of combats and hardy adventures, with comparatively little relief; and it is truly characterized in the romance itself as differing from that of Tristan in the circumstance that the latter is a tale of love and chivalry, while all the brave acts of Meliadus originated from no other stimulus than that of his own attachment to noble actions: „qua ce que il fist il ne fist mie par forces d’armours, mès par force de son cross seulement: De sa propre bonté li vint de faire bien, non de force d’amours.“ It is thus not at all surprising that the numerous illuminations of the manuscript before us consist chiefly of battle scenes, varied now and then with tournaments. 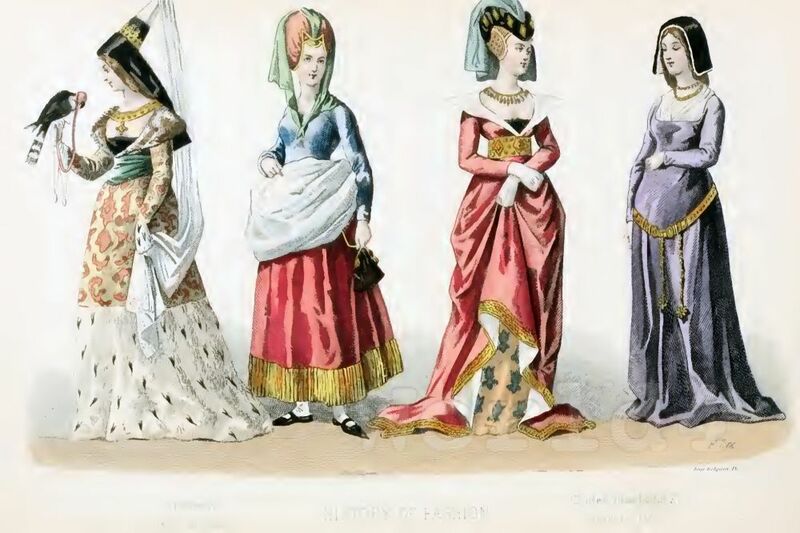 The latter are always accompanied by numerous figures of ladies, as spectators, and have furnished us with the greater part of the subjects of our plate. 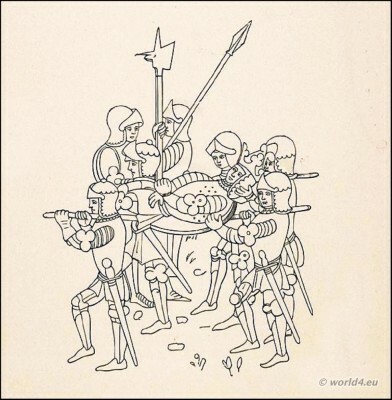 From one of the battle scenes we give the wood-cut on the present page, representing a group of warriors carrying off the body of their king, who has been slain. 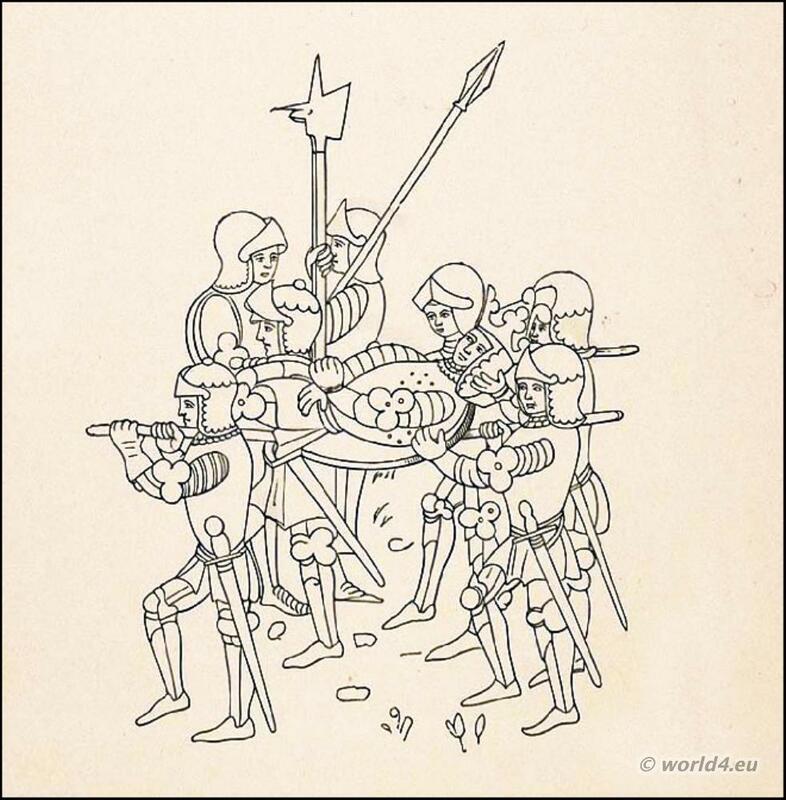 The pictures in this volume are interesting to the artist as being in various states of progress, some only half finished, while others are merely sketched in outline. 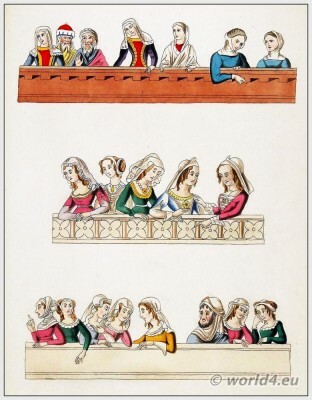 This is not an uncommon occurrence in old illuminated manuscripts. 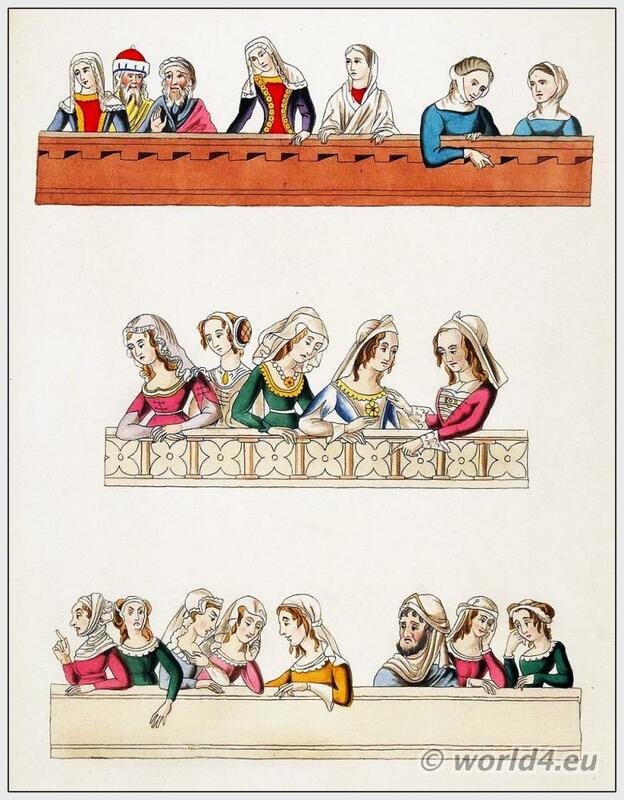 Here and there other subjects of interest are represented; particularly some views of towns, and a curious group of card-players, which is of importance as being the earliest known drawing representing people playing at cards. 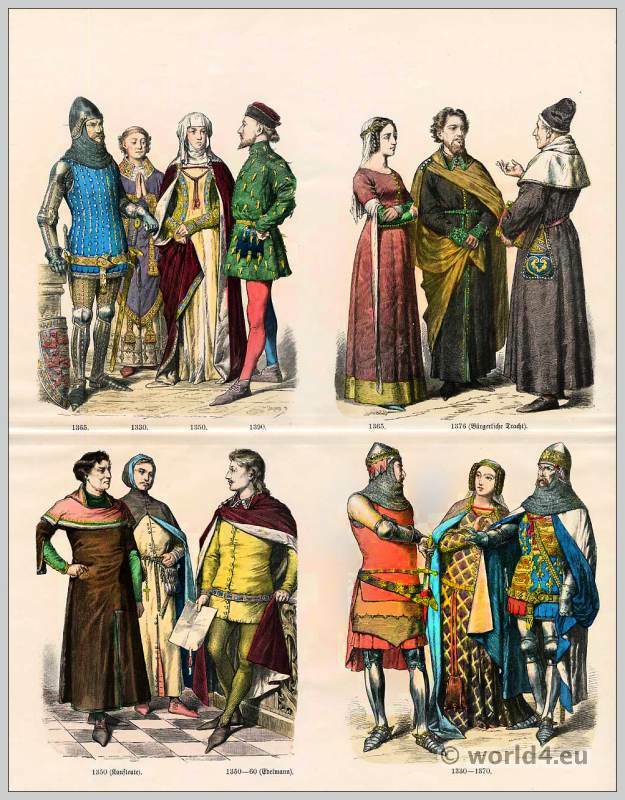 We know from various authorities that they were in use at this time, as they are mentioned in conjunction with other games about, or soon after, the middle of the fourteenth century but they cannot be traced, even by the allusions in old writers, to an earlier period.